In this sweeping history, Ilan Stavans, one of today’s preeminent essayists, cultural critics, and translators, explores the way humans have evolved in their conception of the divine, from an animistic view defined by spirituality to Greek myths and the Aztec pantheon, onward to the development on monotheism as a powerful religion in the Middle East that was crystallized in the biblical narrative. He meditates on what type of divine presences coexist in the Hebrew Bible and how these entities take bifurcating paths in Christianity and Islam. He reflects on the difference between prophetic such as the Abrahamic type and wisdom religions such as Buddhism, Taoism, and Hinduism. In these eight fascinating lectures he also ponders the way philosophers like Plato, Aristotle, Maimonides, Averroes, Aquinas, Spinoza, and Nietzsche reflected on the role of God in the world. 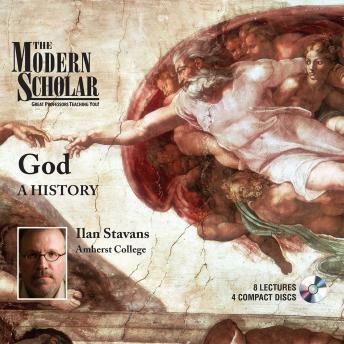 Stavans criticizes the legacy of monotheism as based on violence, analyzes theology from a strictly linguistic perspective, and ponders atheism as an alternative in a world such as ours defined by science and technology. Along the way, he explores his own ordeal—“my wrestling,” as he puts it—with his own personal God. “God: A History” will make the listener question preconceived ideas, seeing them in the larger narrative of human belief.